In today’s always-connected world, reaching new audiences continues to be shaped by the sea change of movement to digital as the cornerstone marketing effort for large businesses. 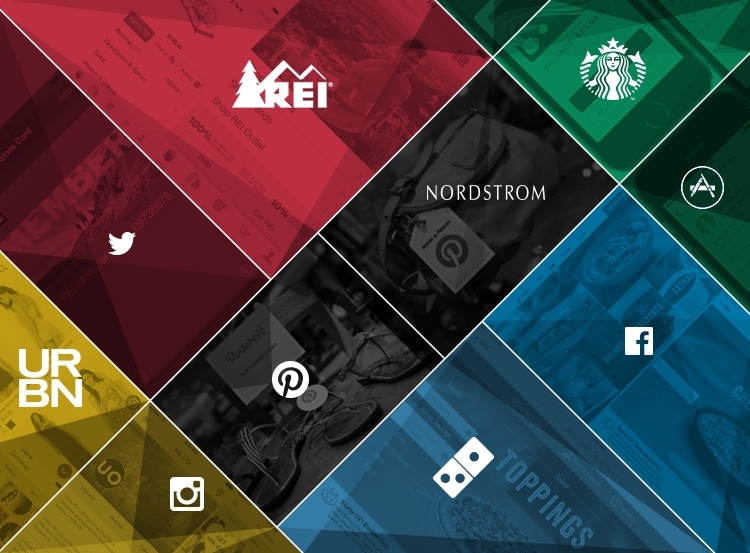 Brands such as Dominos, Starbucks, REI, Urban Outfitters, and Nordstrom have already shifted the way that they approach connecting to consumers with their product offerings in today’s growing digital environment. Discover how these brands make digital work for them and how it compares to your digital marketing strategy. Dominos recently reported a strong quarter despite headwinds from significantly higher commodity prices as a result of this winter's severer weather. When asked what insulated the business from the profit eroding commodity costs, Domino's CEO shared that investment in digital marketing is both saving and building their overall business. Initiatives like a particularly well-received pizza builder iPad app, an interactive pizza tracker, and a $30 million digital media buy with activity in social media, banner ads and paid search are manifesting the growth. See and hear Domino's CEO Patrick Doyle share his company’s digital marketing mix in this video on CNBC. Starbucks continues to recognize the importance of digital in the growth of online shopping and mobile experiences. The company traditionally relied heavily on brick-and-mortar retail foot traffic, but now grows community engagement by adapting their marketing strategy to digitally connected consumers. The focus on social media, mobile payments, mobile gift cards and loyalty point programs are keeping the brand relevant to the connected audience. Listen to the Chairman and CEO of Starbucks, Howard Schultz, share his perspective in this video on CNBC. REI has located their digital sweet spot through the combination of industry leading search engine optimization, coupled with a strong eCommerce platform. The company leverages some of the industries most insightful SEO best practices, and they dominate the first page of Google for a large number of their product offerings. In this interview with Jonathon Colman, REI digital strategist, you can see that the "Love of SEO" is the foundation for the REI web presence. Urban Outfitters understands that their audience is inherently mobile and they have committed their digital presence to focus in that area. The company has recently developed a responsive website to offer a consistent brand and eCommerce experience regardless of the users device. Read a Q&A article with eMarketer and Holly Devine, Urban Outfitter’s Executive Director of Planning, about the company’s approach to mobile. Nordstrom has invested in digital heavily in the past several years, in building an industry leading eCommerce website and with a strong presence in digital marketing channels like Google's Product Listing Ads. Digital investment has netted the company growth of 20 percent online, quarter after quarter, and the additional exposure has helped to off-set challenges with in-store sales. You can read more about Nordstrom’s success online in this Retail Wire article by Rick Moss. * Online/Offline integration helps provide a consistent experience for consumers researching online then purchasing in-store and vice-versa. Nordstrom continues to test these integrations with initiatives such as their in-store Pinterest displays. Published on May 29, 2014 .